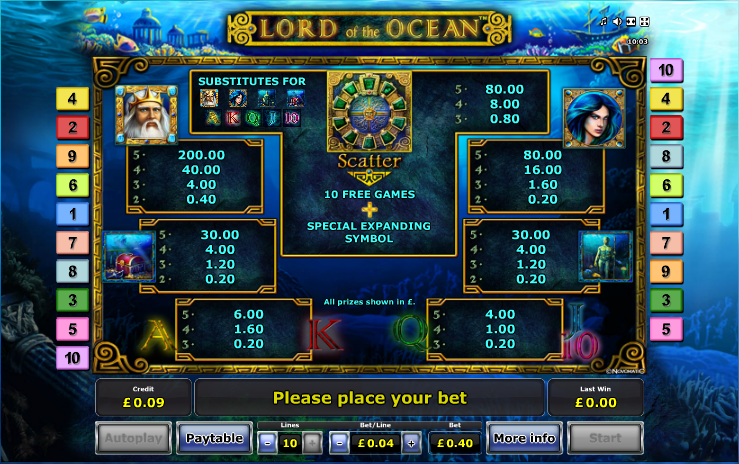 We like a nature-related online slot as much as the next person and so we were more than happy to run the rule over Lord of the Ocean, a game developed by the ever-reliable Novomatic. In fact the theme is nature with a touch of Roman and Greek god-bothering thrown in to spice things up a little. Novomatic slots tend to follow a similar theme, or at least they conform to a certain graphical layout; they look neat and polished and a critic might suggest a bit of variety might be in order but the gameplay is always top notch and Lord of the Ocean is no exception. It features five reels and ten paylines. The main symbols include a moss covered statue of Poseidon, a sunken treasure chest and male and female characters (he could be Neptune). Minor symbols are 10, J, Q, K and A and there’s also an ornate gold symbol which is both the scatter and the wild symbol. There’s just the one bonus feature available in this slot and it’s an always popular free spins round; you’ll need to land three or more of the gold scatter symbols anywhere on the reels. You will now be rewarded with ten free spins but first the game will automatically pick a symbol at random; this may then expand when it appears on the reels to give you plenty of winning paylines. You can see this happen plenty of times in the video below. An Ace was picked in this example but a more valuable symbol will obviously win you bigger payouts. We think the value lies in the free spins so the task is to play with the maximum ten paylines to try and trigger the bonus. Increase your stake a little if you’re comfortable doing that. 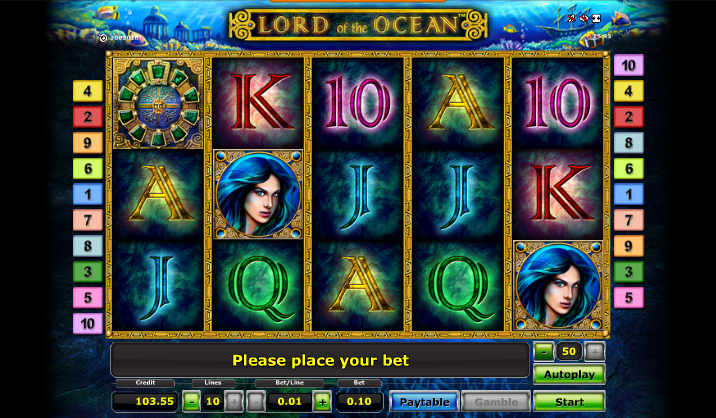 If you like Novomatic slots then you should like Lord of the Ocean; the style of slot will be familiar to you and of course it plays very smoothly. If there’s a criticism it would be that we’d like one more bonus feature and perhaps some explanation of who the characters are but otherwise it’s good fun.